Accessory techniques are generally used along with acupuncture to enhance treatment results. These healing modalities include moxibustion, cupping, guasha, massage, electrical stimulation, hot/cold therapy, Chinese herbs, and a nutritional evaluation. Massage is one of the most important techniques used to move Qi and blood, break up adhesions, relax the muscles, and calm the mind. It can be used to treat musculo-skeletal disorders such as low back pain, muscle stiffness, tendonitis, and arthritic conditions. It can also be used to treat stress-related conditions including headaches, insomnia, anxiety, and high blood pressure. Massage can be used to heal from sports injuries, muscles strains and sprains, and post-operative procedures. Moxibustion is a traditional Chinese medicine technique that involves the burning of an herb "mugwort" on or near the skin to facilitate a healing response. Moxibustion does not burn the skin but rather warms the meridians, expels cold from the body, and promotes the flow of Qi. Moxibustion has been used in China for thousands of years and can be used to treat aches and pains, cold and flu, and even digestive issues. Recent studies have shown that moxibustion can strengthen the immune system. Cupping is performed by placing glass cups over various acupuncture points on the body. Seconds before the cups are placed on the body, an ignited cotton ball is quickly waved inside the cup. Burning the cotton ball inside the cup removes all the oxygen which creates a vacuum. The vacuum stimulates the flow of blood, moves Qi, breaks up obstructions, and draws toxins out of the body. Cupping is effective for treating pain conditions, lung and digestive disorders, and any condition that creates stagnation of qi and blood in the body. Guasha involves the gentle scraping of the skin using a guasha tool or guasha spoon. It is used to release the stagnant blood and qi or “sha” to the surface of the skin. Guasha is a great method to help your body release excess wastes and help bring in refreshing nutrients to your cells. Guasha can be used for aches and pain, tenderness, or tension in the muscles. It is also used to treat the common cold, flu, bronchitis, asthma, as well as any other chronic disorders that involve the stagnation of blood and qi. Chinese herbs and nutritional therapy have been practiced in China for at least 4,000 years. Both herbs and food contain healing properties that can greatly improve the absorption and distribution of nutrients in your body. Each contain medicinal properties that will aid in your healing process. Both can be used in conjunction with acupuncture and other accessary techniques to achieve optimal health. 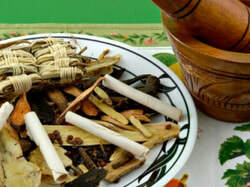 Click Here for more information on Chinese herbs. Click Here for more information on nutritional therapy.